Equal Access to Education Starts With One. At Starts With One, we believe that equitable education is the foundation to the achievement of a better society. The One to One Program was founded in May 2016 by the executive team of Starts With One and a group of dedicated students at Sir Winston Churchill Secondary School. With the prevalence of unequal educational opportunities for students in Vancouver, Starts With One noticed that the disparities within our society were only being augmented. One to One aims to give our community’s youth equal opportunities for academic enhancement by providing students with high quality extracurricular service programs at absolutely no cost to their families. The One to One Youth Mentorship Program was founded by volunteers of Starts With One in May 2016. 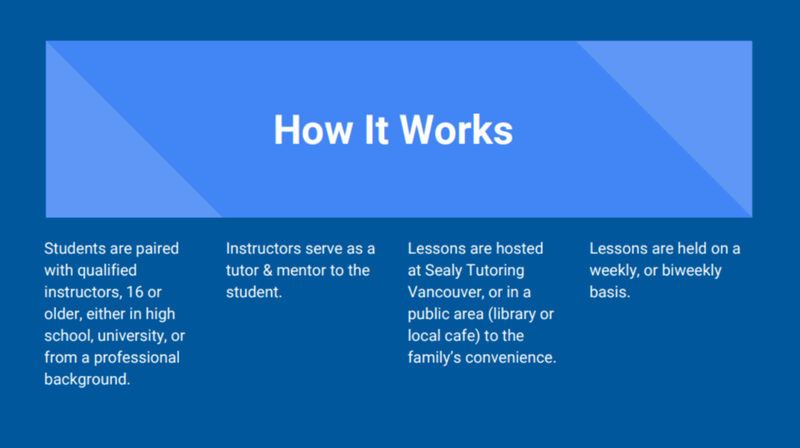 Deeply concerned with the inaccessibility of extracurricular programming for students experiencing financial difficulty, the One to One program was created to allow skilled student instructors to share their knowledge in the form of high-quality extracurricular lessons for interested youth. We believe that the value of academic enhancement provided by fine art lessons, public speaking opportunities, music lessons and basic tutoring is deserving of all students. We are passionate about teaching, and as senior students, we hope that in our final year of high school we can ameliorate our community by helping younger students discover and build upon their passions. Starts With One hopes that the One to One program will not only empower youth, but inspire them for the rest of their lives. Help us give all students the opportunity to discover their passion for learning.